Did Gen. (Retd.) Raheel Sharif protect Gen. (Retd.) Pervez Musharraf from the Treason Trial? 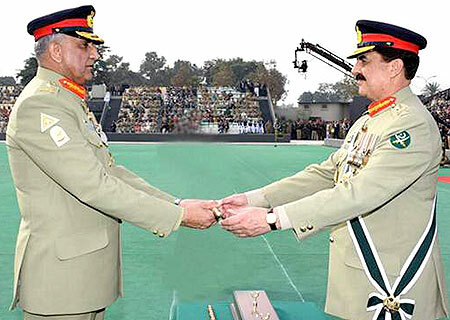 The change of command of the Chief of Army Staff witnessed in November should be taken as a modest win for the maturing of system in Pakistan. Seen purely from the perspective of media rumours of wanting or giving term extension, mysteriously appearing banners asking the outgoing COAS to stay on and the somewhat larger-than-life image created of the outgoing COAS during his tenure, one was hesitant to expect a smooth transfer of command. 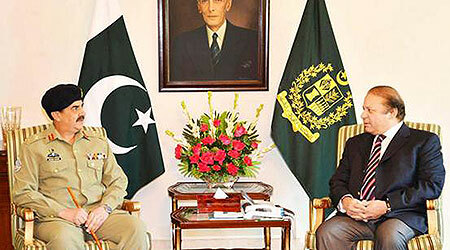 However, to the credit of the outgoing COAS, who had publicly announced as early as January 2016 that he would not be seeking an extension in tenure, when the time came, the appointment and assumption of command by the new COAS marks an important milestone in Pakistan’s democratic journey, and in maturing of our civil-military relations. PILDAT particularly commends the former COAS for publically and candidly announcing his intention to retire on the due date thus firmly closing the door for extension. Extensions to the terms of any officer are an undesirable trend, which not only harm the principle of succession not just within the Armed Forces, but any institution of State and also convey the false perception that the whole institution hinges upon one individual. PILDAT welcomes his decision. The newly appointed COAS must be wished the best in an effective and professional discharge of his duties in what can only be termed as the continuingly challenging field of national defence. If pictures are worth a thousand words, the two photos showing two respective Chiefs of Army Staff calling on Prime Minister of Pakistan upon their appointments, one on November 26, 2016 and the other 3 years earlier on the same date, depict a welcome change in optics in terms of seating arrangements. While the 2013 picture seems to wrongly depict the “equal status” due to seating arrangement, this seems to have been rectified in 2016 keeping in view the constitutional supremacy of the office of the elected Prime Minister of the Islamic Republic of Pakistan. However, much more needs to be changed not just in terms of optics but in elected Prime Minister and his Cabinet collectively exercising executive authority of the Federation 1 in maintaining a constitutional equation and democratic control of the Armed Forces. The 3 year trend alone (please see Box 1) depicts rendering redundant the role of the Federal Minister of Defence when it came to the Premier and COAS interactions. The crucial National Security Committee, created for the first time with a proper secretariat in 2013, has almost completely been tossed-aside (please see Box 2) in consultations on critical matters of national security during the past 3 years. In a country that has suffered severe blows to its democratic system at the hands of military coups and a nearly omnipresent office of the COAS and resultantly suffers from a severe schisms in perceptions of the civil and the military, rendering dormant the very NSC that provides a critical forum of consultation 2 on national security issues, as well as an opportunity to bridge the perception gaps, defies all logic. PILDAT has consistently maintained that regular and institutionalized consultation between the elected civil and military leadership at the forum of the NSC is an urgent and consistent need, not just because we face multiple national security challenges that beset our nation, but equally because it is the forum that allows elected government and the military to thrash out their differences to carve out a unified strategy and approach on critical issues. With new COAS in office, one expects that he will do everything in his power to uphold the constitutional structure under which the elected Government is charged with the responsibility for final decision making on national security as in other matters of State. The Military is and must be recognized, respected and appreciated for its critical roles and responsibilities in ensuring impenetrable national defence of Pakistan while the Government must seek and consider its advice through institutionalizing a consultative decision-making process on national security issues. The Federal Cabinet of ministers must also be involved more effectively in decision making including the ones relating to national defence and security. It must be kept in mind that above all power-plays stemming from years of differences in perception, distrust and disregard and often even contempt that has come to define civil-military relations in Pakistan, the ultimate victim in creation and perpetuation of multiple centres of power is Pakistan, is our vital interests and we, the people of Pakistan. Since Gen. (now retired) Raheel Sharif’s appointment as the COAS on November 28, 2013, he met the Prime Minister nearly 102 times in 3 years. Of these, 32 meetings, that are 31%, were one-on-one interactions. The Federal Minister of Defence, Khawaja Muhammad Asif, MNA, was present in only 29% of the 102 meetings, serving to weaken the role of the Federal Minister of Defence, the civilian boss of the Military commanders. In Premier-COAS interactions, the National Security Advisor was present in only 36% of these 102 meetings. While Prime Minister and COAS met 102 times in 3 years, only 5 meetings of the National Security Committee (NSC) were held in 3 years. The initial structure of the CCNS was announced to have Prime Minister in the Chair while Ministers of Foreign Affairs, Defence, Interior and Finance alongside three Services Chiefs as full members. Perhaps considering the anomaly that Services Chiefs could not be a member of a Cabinet Committee, the nomenclature of the CCNS was changed to the National Security Committee (NSC), as notified on April 11, 2014. Since its reconstitution, the NSC has has only met 4 times, i.e., on April 17, 2014, October 10, 2014, April 06, 2016 and July 22, 2016. According to the daily Dawn’s story of October 06, 2016, the National Security Committee also met on October 03, 2016, although no presser was issued in this regard. Overall, since its formation, the Committee has met only 6 times since its formation in August 2013 till November 2016, making it to be a periodicity of one meeting almost every six months & 15 days. It must be noted that similar bodies that exist around many democracies including USA, UK, India, Turkey and other countries meet on weekly basis in most countries. In order to be an effective forum and the fact that Pakistan has no dearth of national security challenges, Pakistan’s NSC must meet atleast fortnightly, if not weekly. Given Pakistan’s peculiar civil-military relations, the office of the COAS (or its former equivalent of the Commander-in-Chief) has on four occasions usurped power overtly through Military takeovers. Even otherwise, it has attained a larger-than-life image. Therefore, the Army Chief has always been present as a power broker, whether through the Constitutional provision of 58(2)b, or as part of the ‘troika’ of power centres in the 1990s. PILDAT had earlier analysed that 3 by the end of Gen. (Retd.) Raheel Sharif’s tenure, the civil-military imbalance in Pakistan seemed to have increased, with the Military leadership seemingly establishing itself as the final arbiter on national security and certain domains of our foreign policy. The elected Government on the other hand appeared to be relegated to either an auxiliary role, or a parallel national security regime.4 Therefore, although a narrative of the civil-military leadership ‘being on the same page’ was perpetuated partly through these 3 years, the relationship remained frayed at best. The silver lining of there not being a direct intervention hardly constitutes as something to be thankful of. One particular manifestation of the civil-military imbalance associated with Gen. (Retd.) Raheel Sharif was his larger-than-life profile both internationally and at home. This was perpetuated through the extraordinary proactiveness exhibited by the ISPR, which was seen to be taking the lead even on announcements such as the formation of Military Courts or of Provincial Apex Committees. It is a debateable point whether this scenario developed because of civilian authorities complacency in giving out the information efficiently and effectively. The resultant creation of a messiah-like image of the COAS is perhaps best epitomized by the popular tagline of #ThankYouRaheelSharif. This was also accompanied by a reported regrettable culture of media advice by the ISPR, leading to concerted media management. As PILDAT had previously noted, this will be a tough act to follow for Gen. Qamar Javed Bajwa. If he fails to maintain the media standing surrounding Gen. (Retd.) Raheel Sharif, the public might needlessly question his performance. Therefore, a careful rollback of this policy is required, so that the military leadership is protected from any unwarranted criticism. Despite the diverse views on the desirability and quantum of the publicity generated, one must, however, grant that the current DG-ISPR Lt. Gen. Asim Bajwa did an extraordinarily efficient and effective job of public relationing both for the institution and the former COAS. Now that Gen. (Retd.) Raheel Sharif has relinquished the command of the Armed Forces, it seems that officials closely associated with various issues of contention between civil-military leadership have started to open up about them.